Expedition 41 Flight Engineer Alexander Gerst of the European Space Agency, left, Commander Max Suraev of the Russian Federal Space Agency, center, and NASA Flight Engineer Reid Wiseman, sit in chairs outside the Soyuz TMA-13M capsule just minutes after they landed in a remote area near the town of Arkalyk, Kazakhstan Monday, Nov. 10. 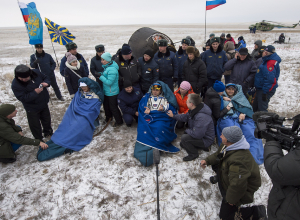 Suraev, Wiseman and Gerst returned to Earth after more than five months onboard the International Space Station where they served as members of the Expedition 40 and 41 crews. Three International Space Station crew members have returned to Earth after a 165-day mission that included hundreds of scientific experiments and several spacewalks. Expedition 41 Commander Max Suraev of the Russian Federal Space Agency (Roscosmos) and Flight Enfineers Reid Wiseman of NASA and Alexander Gerst of the European Space Agency touched down northeast of the remote town of Arkalyk in Kazakhstan at 10:58 p.m. EST (9:58 a.m., Nov. 10, Kazahk time). While in space, they traveled more than 70 million miles. During their time aboard the station, the crew participated in research focusing on Earth remote sensing, advanced manufacturing, and studies of bone and muscle physiology. They set a milestone for station science by completing a record 82 hours of research in a single week in July. A key research focus during Expedition 41 was human health management for long duration space travel, as NASA and Roscosmos prepare for two crew members to spend one year aboard the space station beginning in 2015. The crew welcomed five cargo spacecraft during its time aboard the orbiting laboratory. Two Russian ISS Progress cargo vehicles docked to the station, bringing tons of supplies in July and October. The fifth and final European Automated Transfer Vehicle, dubbed the Georges Lemaitre after the Belgian physicist who is considered the father of the big-bang theory, launched to the station in July. In July, Orbital Sciences’ Cyngus spacecraft completed its second resupply mission under NASA’s Commercial Resupply Services contract. SpaceX launched its Dragon spacecraft to the station in September, the company’s fourth commercial resupply mission. Wiseman and Gerst ventured outside the confines of the space station for a planned spacewalk to relocate a failed pump module and configure the station for upcoming additions. Wiseman completed a second spacewalk with fellow NASA astronaut Barry Wilmore. Suraev also conducted one spacewalk during Expedition 41. In addition to being a scientific research platform, the space station also serves as a test bed to demonstrate new technology. The first 3-D printer to be tested in space arrived at the station during Expedition 41. It will be the first step toward establishing an on-demand machine shop in space, which is a critical enabling component for deep space crewed missions and in-space manufacturing. A new Earth monitoring instrument called RapidScat also was installed and activated on the station during the crew’s time in orbit. RapidScat will measure Earth’s ocean surface wind speed and direction, essential measurements used in weather prediction. Having completed his second space station mission, Suraev now has spent 334 days in space. Wiseman and Gerst have spent 165 days in space with the end of their first flights. Expedition 42 now is operating aboard the station with Barry Wilmore of NASA in command. Wilmore and his crewmates, Flight Engineers Alexander Samokutyaev and Elena Serova of Roscosmos, will tend to the station as a three-person crew until the arrival in two weeks of three new members: Terry Virts of NASA, Anton Shkaplerov of Roscosmos and Samantha Cristoforetti of the European Space Agency. Virts, Shkaplerov and Cristoforetti are scheduled to launch from Kazakhstan on Nov. 23.